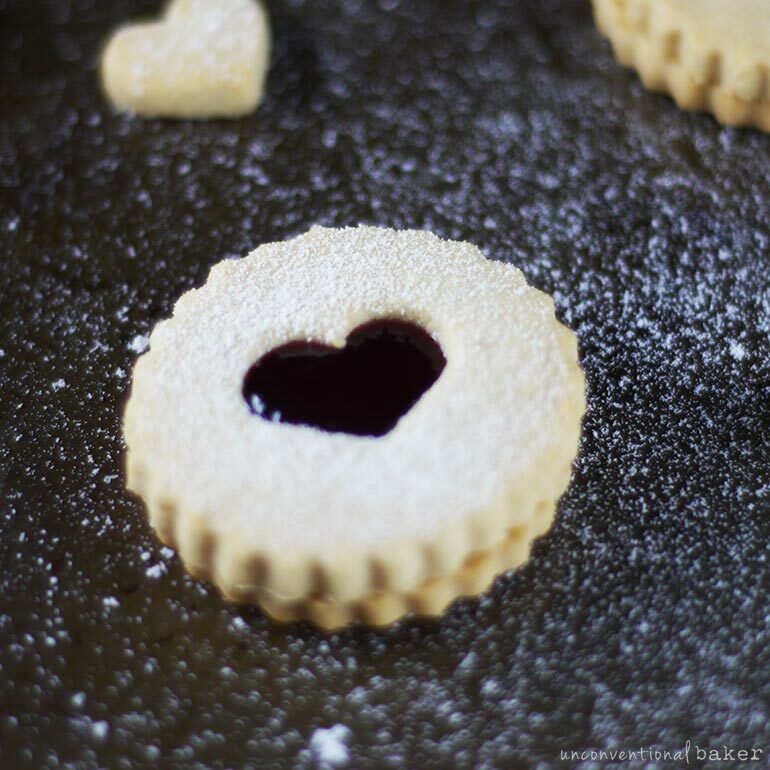 Making a gluten-free and dairy-free linzer cookie that tastes good, cuts nicely, and holds its shape can be a bit tricky (if things go askew, it can be a sticky and unsightly affair — trust me on that one ;) ). I used to make a lovely version may years ago, but it was of course made with sugar — inside and out, so I was super happy with this recipe to cut that part out and enjoy these little cookies once more without compromising their flavor or the sugar cookie appeal. 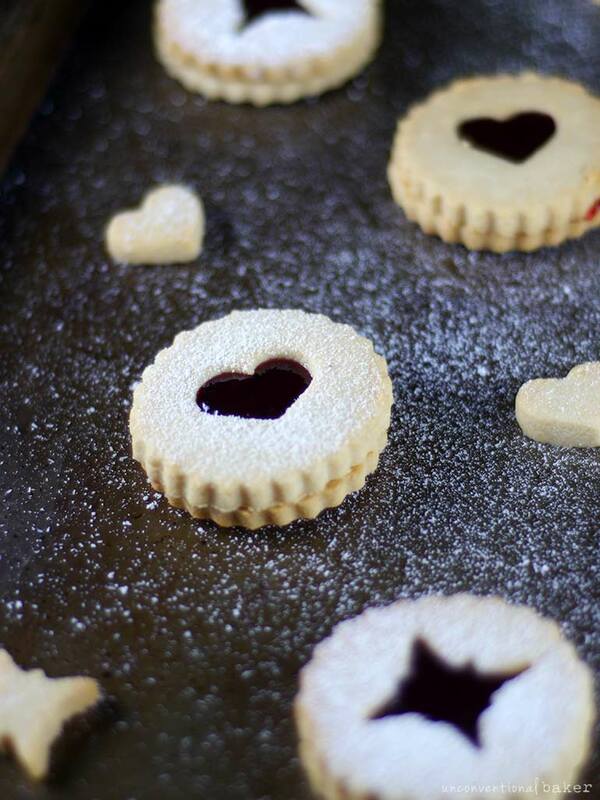 One of the essential things for this cookie to happen is having a linzer cookie cutter. You can sometimes find them in the regular cookie cutter section of shops, especially around the holidays. I couldn’t though, so I got mine on Amazon. These are the ones I use (though mine have slightly different attachments) — I’ve had them for years and I love them. There are so many kinds you can get on Amazon though, with lots of different shapes if you’re looking for something different. The other thing, in case you haven’t been following along long enough, let me let you in on one of my favorite little trade secrets, as it’s an essential one for a proper linzer cookie in my opinion: that stuff you see powdered on top of the cookies in the photos is not powdered sugar. Did I fool you? I think I even fooled myself a little. 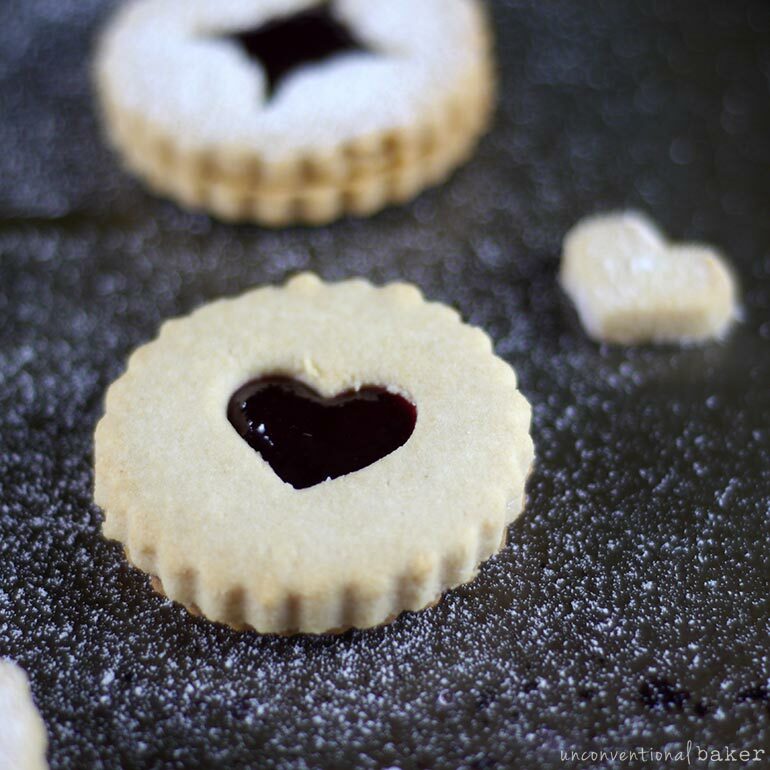 These pretty linzer cookies are lightly crunchy and so easy to make! 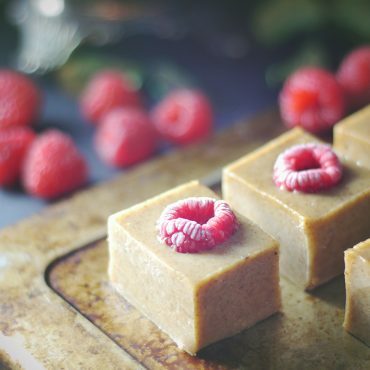 Gluten-Fee and vegan so go ahead and share them with everyone at the holiday party. Preheat oven to 350F. Line two cookie sheets with parchment paper. 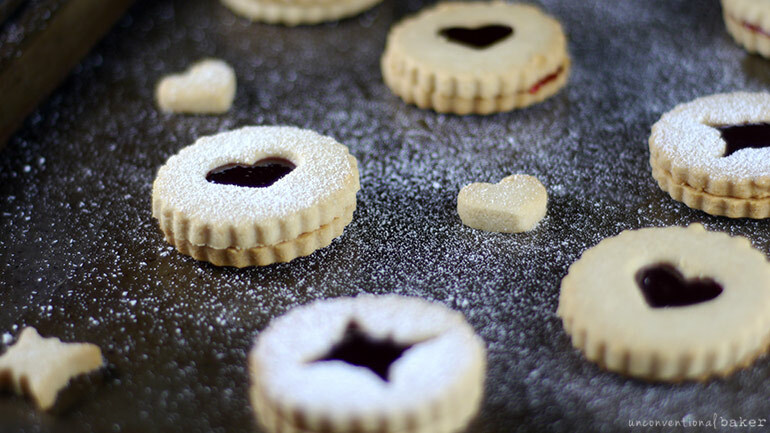 Have your linzer cookie cutters (these are the kind I use) handy, and prepare a rolling area with two additional sheets of parchment paper for that. Place butter in a large mixing bowl and whip it with a mixer until it’s creamy. Add sweetener, salt, and vanilla and mix once again to combine. Add in flour and use a wooden spoon to mix. Then get in there with your hands and mix everything together by working the dough with your hands until you can shape it into a ball (note: dough should not be sticky but should press together when pinched — if it’s a little sticky, add a little more flour, but be sure to knead it well first). Divide dough and shape into 2 balls, then flatten each into a disk. Roll out one of the dough disks in between two sheets of parchment paper (always rolling away from yourself) into a ¼” thickness. Cut out the cookies using a cookie cutter, cutting half of them with the plain cutter, and half with the center shape cutter (so that you end up with an equal amount of bottom and top layer cookies). Carefully transfer to a prepared cookie sheets, spacing them ½” apart (they won’t spread as they bake). Gather up any dough scraps and repeat until all dough is used up. Then repeat the process with the other dough disk. Bake in a pre-heated oven for approximately 13-14 minutes, until the edges begin to become a little golden. Remove from oven and place on a cooling rack. (Note: cookies will harden a little within minutes of cooling, so don’t overbake). Allow the cookies to cool for 10 minutes. If dusting with coconut milk powder or powdered sugar, place all the center cut shaped cookies on a wire rack (ideally lined with parchment or a large plate underneath). Dust with the milk or sugar until you’re satisfied with how they look. Take the regular shaped cookies (the bottoms) and flip them upside-down. Place ½ tsp jam in the middle of each cookie (don’t be tempted to over-jam, as it will end up spilling from the sides later — ½ tsp goes a long way!). Cover with the dusted cut out cookies on top and enjoy :) Store at room temperature in an air-tight container. *For the jam, if you’re looking for a refined sugar-free option, you can try some fruit-sweetened store bought versions, like this St. Dalfour jam for example. Or alternatively, can use something like this easy homemade raspberry or blueberry jam. Happy baking & happy holidays! Disclaimer: this post contains affiliate links to linzer cookie cutters, Pamela’s flour blend, and powdered coconut milk. My humble suggestion: it would be great if you included the measures in grams in your recipes. Many errors are due to the measurements in cups. With a digital scale there is no possibility of error! I love everything in your blog! I want to add to those saying the flour to liquid ratio is off on this recipe. 4.5 cups is way too much. I should have read the comments and stopped when I reached a nice consistency but instead I tried to keep adding more (as the recipe says), and it was a crumbly mess. I only managed to get 3.5 cups in and I kneaded for a solid 20 mins. Please amend this recipe to say you may need way less than 4.5 cups and go stop when it reaches the right consistency. There are quite a few of us having this issue so it doesn’t seem to be a fluke. Also, fixing it after the fact is very difficult. Christina, what flour blend did you use? Pamela’s, or the DIY I suggested, or a different mix (if so, which one)? Thanks for the feedback, Joan — much appreciated! :) Glad you enjoyed the cookies. I made two batches of these cookies. I live at a very high altitude and that means measuring flours in grams beats cup measurements every time. The first round ended up much too dry and I made it work by adding lots of water. For the second round, I looked up all-purpose flour cups to grams (1 c = 120 g) equivalents and weighed it out. The dough was perfect for me on the second try…and they sure are adorable. To add interest, I also snuck in some almond extract into the maple syrup. I just love how almond extract complements raspberry jam! Hi, I baked these yesturday and they didn’t work at all. The first sheet was perfect but when I rolled the pastry again it didnt smoothen as nicely and the dough became gummy and the cookies shrink after I cut them and didn’t stay in shape. I used regular flower instead of gluten free, but didn’t do anything differently. Could it be that there was too much flower in my pastry, eaven I only put 3,5cups and it was firm after that? Can’t figure out any other explanation. They still taste delicious though! Hi Kiia. So sorry they didn’t turn out for you for some reason. Hmmm… I wonder, was it just plain white flour or another kind? Also, what is the size of your measuring cups? It sounds like there was too much flour somehow, in comparison to the liquid. So if that happened to me now, I’d add a bit more liquid to compensate for it so that it doesn’t shrink up. 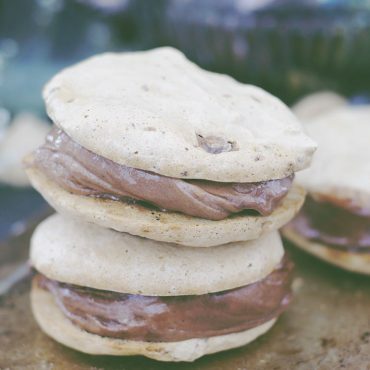 Can I make these with regular flour? Will I need to change the amount of flour if I do? Hi Patricia. You can make them with regular flour — equal measurement for the gf mix. The texture of the dough was so crumbly and it was not sticky. Did not turn out weel. If anyone wants to try this then fine, but I’m just telling my experience. My niece said atleast we tried I said I spent a lot of money for nothing (cause these ingredients aren’t cheap). Hi Niara — thank you for sharing and sorry the recipe didn’t work out for you. Did you change anything in the recipe? It sounds like there was either a bit too much flour or too much starch in there.. If the dough is on the dry/crumbly side, you could just add a bit more sweetener or butter and that would make it wet/sticky again. Hi Audrey, these cookies devine! Would love to try then out but where did you get the cookie cuters from?. Im looking for the ones that cutout in the center, so the jam can be seen. They’re called Linzer Cookie Cutters. I added info about them and where you can find them above now. I got mine on Amazon.com a few years ago and they work great. They usually come with several attachments so you can make different shapes. These are the ones I use. I love linzer cookies too, especially with raspberry jam. I like that you made them with maple syrup. hi can i use regular butter in these? Thanks for linking up at our Gluten Free Fridays Party! I have tweeted and pinned your entry to our Gluten Free Fridays board on Pinterest! :) I can’t wait to see what you share next time!